If you grew up in the ’80s, a lot of this book will resonate. ‘Story of My Life’ is about a disaffected, privileged young woman who lives in NYC, and has everything she needs in a material sense, but a distant relationship from her parents who substitute money for their love and attention. Throughout the book you see a young woman, left to her own devices to figure it all out, amidst parties, drugs and similarly alienated friends and family. She yearns for more but can’t say what the “more” is, because she’s never really had it. But what she does have are ample opportunities for sexual and other adventures that she describes with such distance that it breaks your heart. It’s written in the first person, the protagonist is female, and the author – the amazing Jay McInerney – is of course male. But he wrote this young woman so well, it’s amazing. You know his work; he wrote the acclaimed ‘Brightness Falls’ and ‘Bright Lights, Big City’ which became a movie. For my money, he’s the writer whose voice, more so than any other, captures the soul of New York City and the many people who try to invent and reinvent themselves there. This book, ‘Story of My Life’ was read aloud with my college roommate over a single night. We LOVED it because NYC loomed large in our lives at the time. Both the book, and the memory of that night with my roommate (and still one of my dearest friends) are incredibly important to me. I hope you read and enjoy it. The stories I like best are the ones where I feel as though what’s not being told is far more important than what is. ‘The Secret History‘ by Donna Tartt is one such book. There is a subtlety about her voice in this book that you can’t help but admire if you’re a writer because you understand how irrepressible the “urge to tell” is, if you’re a storyteller. Another thing that makes this book incredible is that it has so many characters and yet each one is very much an individual, and their relationships with each other are so complex and well-developed. If I had to think of one word to describe the voice in this book, it would be ‘disciplined’, or perhaps ‘controlled’. It doesn’t sound complimentary, but I definitely mean it as a compliment, because I think that’s the hardest thing to develop as a writer – control and discipline in how you use your voice. Lots of reviews say the writing is overwrought, but I disagree. I think they’re just a teensy bit envious, frankly. Her choice of language seemed to me to be very deliberate given the setting and characters. And oh yeah, great plot as well. Read it. I’ve been super-busy these last several days with my other work – you know, the non-writing job that distracts me from my true love. But I did promise to post books that I think are strong examples of unique ‘voices’ in writing. And this one, is perhaps my favorite. 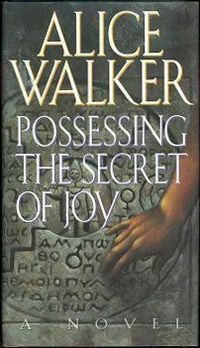 ‘Possessing the Secret of Joy’ by Alice Walker. If you like plain prose, this ain’t gonna be your thing. Still, I was so moved by this, and so obsessed with this book, it almost made me stop writing. I read it and was like, “Okay, I don’t know what to call the crap I’ve been producing, but it’s not writing. This (Alice Walker’s Possessing the Secret of Joy) is writing.” Now I’m older and wiser so totally get that there’s room for different voices, different points of view, different ways of looking at the world. But I can’t lie, this book almost convinced me I should pack it in and concentrate on just being a lawyer.